Plants have this power to perform photosynthesis by which they make food in presence of sunlight and release oxygen.For making food, plants use carbon dioxide and water. This is known as carbon dioxide fixation. In turn animals use this oxygen for respiration. Oxygen breaks food down to release energy and carbon dioxide. Plants provide shelter for animals and they make oxygen for the animals to live. When animals die they decompose and become natural fertilizer plants. Plants depend on animals for nutrients, pollination and seed dispersal. Plants take carbon dioxide during photosynthesis and release oxygen into the atmosphere. 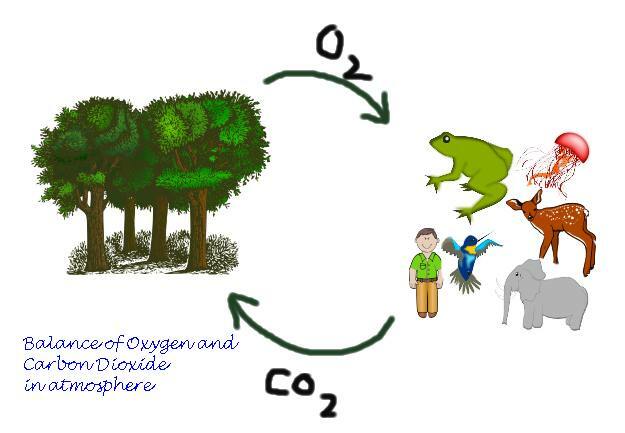 Animals and plants take oxygen and release carbon dioxide during respiration. Thus, both plants and animals help each other in the exchange ofgases in the atmosphere. do you find that all living beings eat same kind of food. why? The nutrients which mainly give energy to our body.